My (barely) four-year-old has officially started a countdown for Halloween. Not that she REALLY remembers Halloween from last year–she just has some vague notion of fun costumes, getting to play games at the library because it’s a holiday (huh? ), and ridiculous amounts of candy. We do sweets in moderation, but there’s nothing moderate about the amount of candy we’ll get from even a short trip around our ‘hood. So I always like it when we come to a house that gives out something other than candy. It’s nice to have variety, kwim? Ice pops. There are a few houses in our neighborhood that hand out an ice pop to each trick or treater. They’re relatively inexpensive, and there are versions that are 100% apple juice! Freebie Coupons. 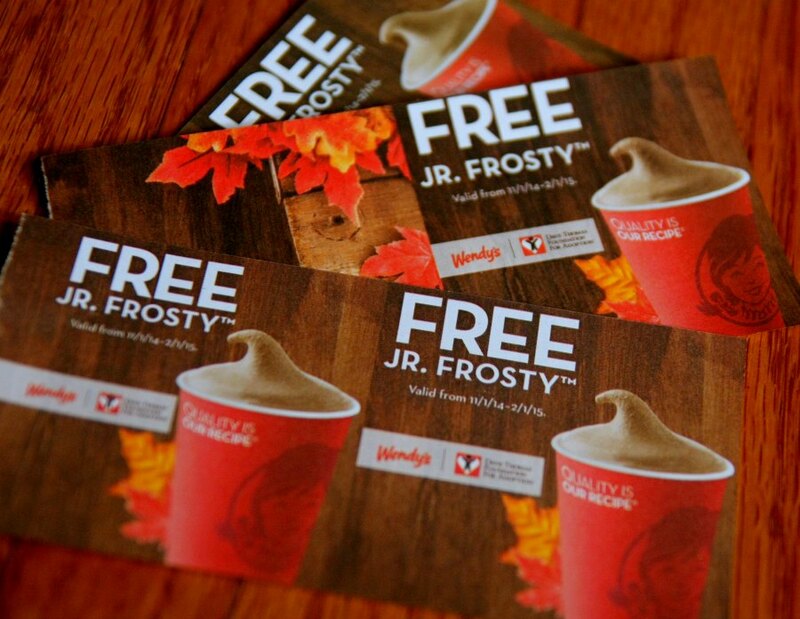 We just purchased Jr. Frosty coupon books from Wendy’s yesterday! Mini pumpkins. Our farmers’ market wraps up at the end of October, and my dad (the pumpkin farmer) often ends up with an excessive amount of mini pumpkins. We pass these out to kids as a sugar-free candy alternative. Spider rings. We’re working on our trunk for our church’s “Trunk or Treat” festival. Instead of candy, our group is going to have a bean bag toss game and let kids choose spider rings off of a giant web. You could also offer them to kids like we did here in our creepy, crawly, cauldron play invitation. Fruit. In this day and age, I’m sure there are people who would frown on passing out fresh fruit for sanitary and safety reasons. But have you seen the little clementines that are decorated with black marker to look like jack o’lanterns? 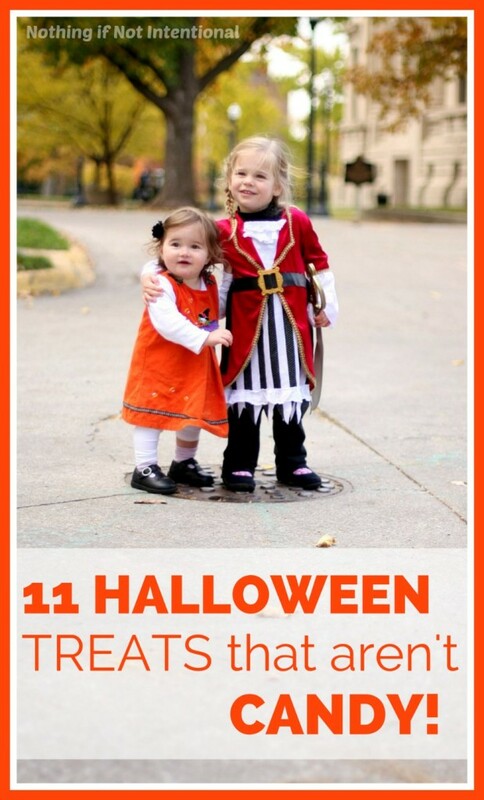 Those are great for a play date, fall party, or to pass out to friends! Toothbrushes and toothpaste. I will never forget the first time I trick-or-treated at a dentist’s house, and he handed me a toothbrush instead of candy. As a kid, I thought it was kind of a lame. But now that I’m a parent, I think it’s genius. An oral hygiene brand might be willing to donate supplies. Miniature bags of pretzels. I love it when my girls get snacks instead of sugar. Temporary tattoos. My girls would go crazy for these! Small Toys–like cars or figurines. One of our neighbors offers toy cars to the neighborhood kids. So sweet, right? Glow sticks. The cost per item is pretty low if you buy large packages of glow bracelets. Stickers. 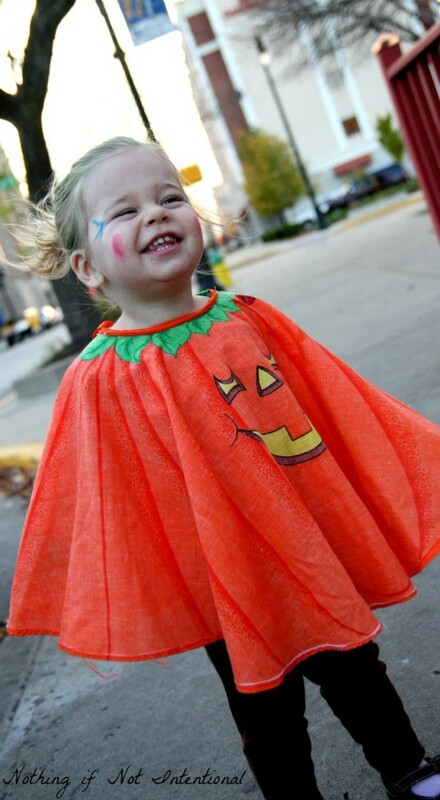 Small sheets of Halloween stickers (designed for favor bags or party treats) would be a hit with my girls. Stamps, pencils, crayons. Art supplies that I could throw in my purse or leave on a table at home would be a welcome treat for our family. Juice boxes. Wouldn’t want the little ones to get dehydrated! ← Melted Crayon Pumpkins: No-Carve Pumpkin Decorating with Kids!